Welcome to the Vegan Society of P.E.A.C.E. "Be a Voice for Billions!" © Vegan Society of P.E.A.C.E. We are an independent, grassroots 501(c)(3) nonprofit community organization which educates the public on ethical vegan living, abolitionist animal rights advocacy, environmental responsibility, plant-based nutrition, human rights, world hunger solutions, and peace and nonviolence (Ahimsa). We are dedicated to promoting P.E.A.C.E. and Compassion for ALL sentient beings through education, outreach and advocacy. Our headquarters is in the nation's 4th largest city -- Houston, Texas, and our support base is global. 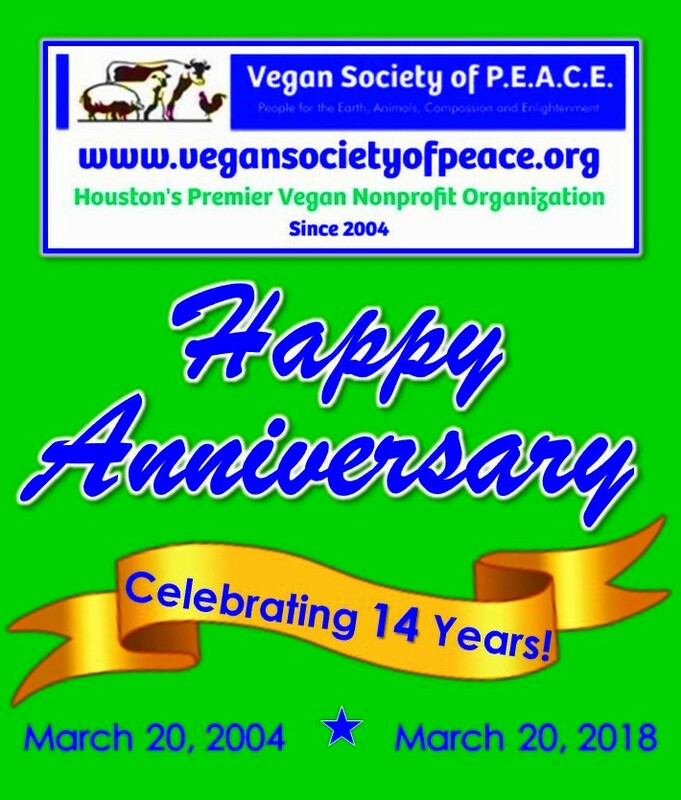 Since our formation in 2004, we continue to be an independent, 100% volunteer-run organization advocating for veganism. We greatly appreciate the support and generosity of our members worldwide. Vegan Society of P.E.A.C.E. 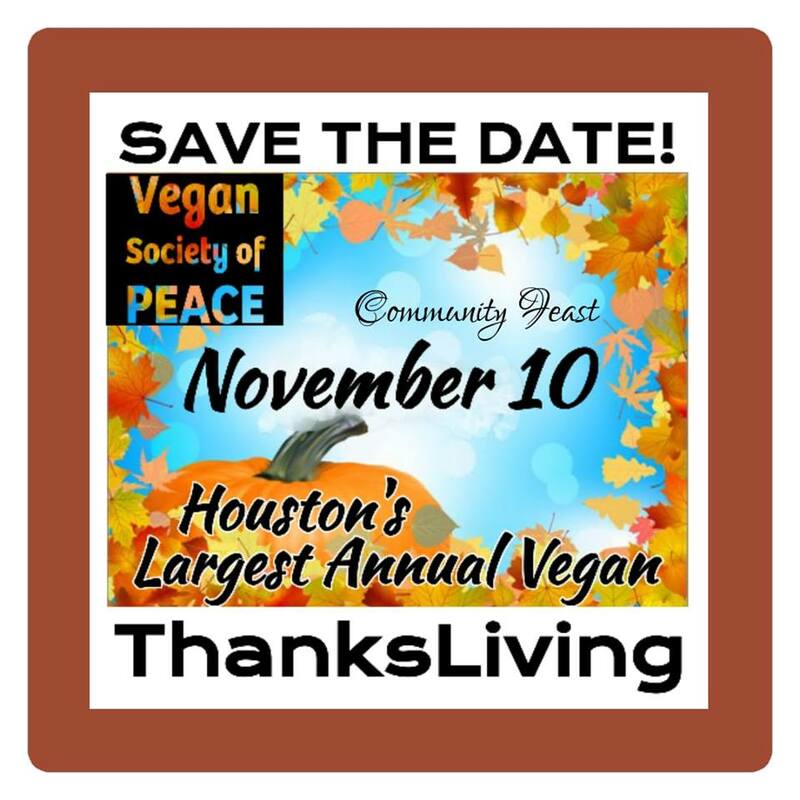 also produces and hosts VegFest Houston: The Premier Vegan Community Festival of Texas, monthly Vegan "2nd Saturdays" and "4th Sundays", Houston's Largest Annual Vegan Thanks-Living, plus we created TEXAS GO VEGAN WEEK, an Annual Celebration of Vegan Living. 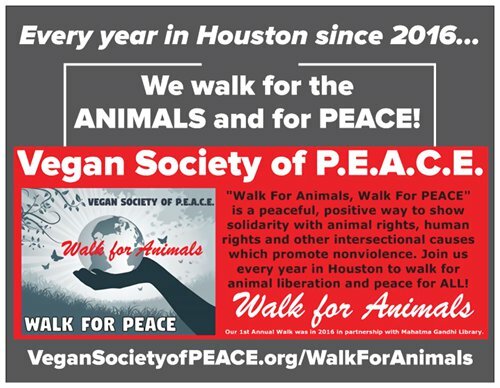 We launched exciting new outreach projects and events like the Vegan Library Project, the Vegan Gratitude Campaign, the "Walk For Animals, WALK FOR PEACE" in 2016, and the Houston Vegan Awards in 2017! Our community organization actively works to create a peaceful world for ALL life on the planet. Join us in creating a society of peace, where people care for the earth, work to liberate all sentient beings from exploitation and oppression, and endeavor to enlighten the world through a message of universal compassion and nonviolence! In March 2018, we will celebrate our 14-Year Anniversary! It has been an honor to inspire so many to live vegan and to "Be a Voice for Billions" of animals! We look forward doing even more in the decades ahead. Thank you for your support! Vegan Society of P.E.A.C.E. is pleased to launch the first-ever Houston Vegan Awards in 2017! This will be an annual event where the public votes on the best of the best each December and winners will be announced every Winter during the New Year! Inspired by our annual "Hall of Fame" awards given during Vegan Thanks-Living, the Houston Vegan Awards will give recognition to those who work hard to make Houston vegan-friendly. The annual winners are determined by community votes. All who complete the online survey will be entered to win a great prize package! With the support of our dedicated volunteers, our founders created the VegFest Houston festival which debuted in 2011. VegFest Houston is The Premier Vegan Community Festival of Texas and continues to grow each year! We are Houston's Original Vegan Festival! This amazing, diverse, all-vegan community event is held right here in the nation's 4th largest city! It's no wonder, since Houston is ranked the 4th "Most Veg-friendly City" in the nation as of 2012, making us the top Texas Veg-friendly city! This festival is produced entirely by volunteers from our nonprofit organization! Our popular event features "Ask A Vegan" panels, vegan food vendors and exhibitors, family-friendly makerspace & kids activities, giveaways and more. VegFest Houston Vegan Festival promotes an ethical, compassionate and truly sustainable world for all! Ours is one of the most diverse vegan festivals in the nation!!! Come and be inspired at #VegFestHouston! We had over 6,000 attendees at our 6th Annual VegFest Houston Vegan Festival of Texas on July 21, 2018! Join us for our 7th Annual VegFest Houston Vegan Festival on July 13, 2019 at Minute Maid Park! Our "Texas Veggin'-out Days" campaign was created in 2006 and later evolved into "Texas Go Vegan Week". We were awared "Most Notable Outreach by a Group" by the North American Vegetarian Society (NAVS) in 2007 for launching this campaign. Join us in celebrating and promoting ethical vegan living in Texas during the first week of October! This coincides with our World Vegetarian Day and World Farm Animals Day outreach. It's held annually during the week of October 1-7! Organizations and businesses throughout Texas are encouraged to participate. Several businesses have special offers and promotions during "Texas Go Vegan Week". Here in Houston, we host outreach, education and dining events throughout the week. Please contact us to request promotional cards and flyers for your vegan business. Click here to see media coverage of our 2009 Meat-out outreach event and film screening in Houston! Click here to see media coverage of our 2010 Worldwide Vegan Bake Sale Week event! 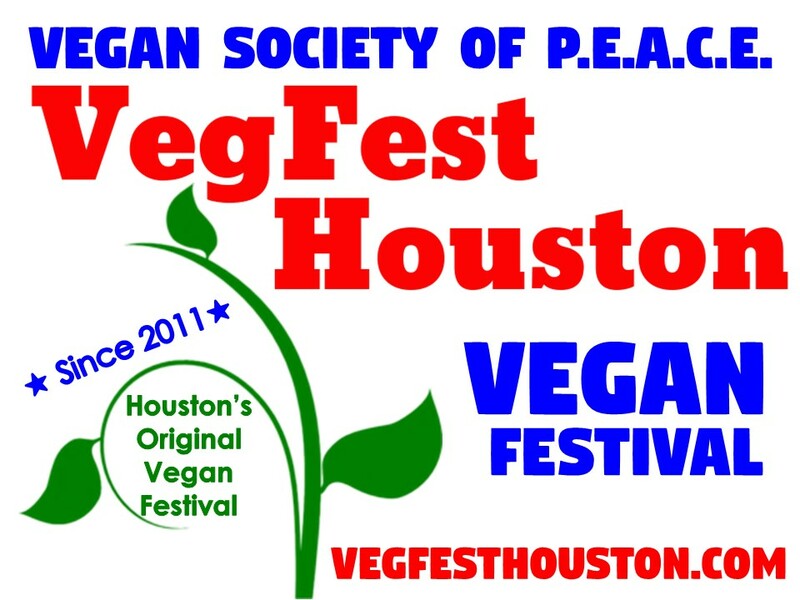 Click here to see media coverage of our 2011 Inaugural VegFest Houston and our 2012 2nd Annual VegFest Houston! VegFest Houston is the Premier Vegan Community Festival of Texas! 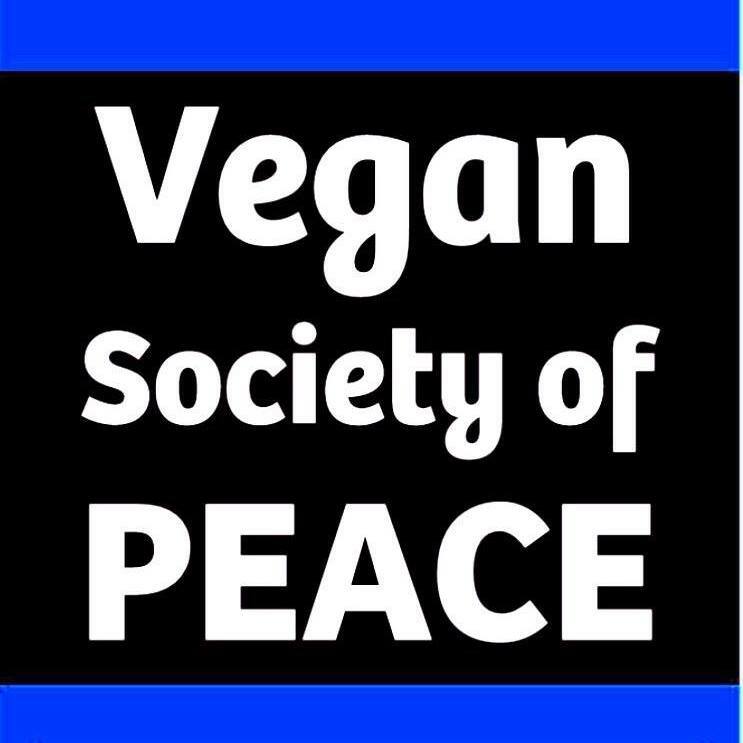 *Vegan Society of PEACE raised over $1,800 for Haiti Relief in 2010! Read more on our Spotlight page and see our announcement here! Thanks to all who support our vegan bake sales, which benefit so many wonderful causes!